Tis the season! When you have to travel with little kids, things can get tricky. Long car rides, plane rides, disrupted naps, schedules gone askew, and kids who get completely overstimulated. It sounds like a nightmare, but never fear, it doesn’t have to be that way! If your kids are of that blissful age where they sleep in the car then you can simply plan your trips around their naps. For us that means that we try to have the longest leg of our journey (for day trips) around 1pm. This way, our little Monkey gets in his nap and isn’t grumpy when he sees his grandparents. 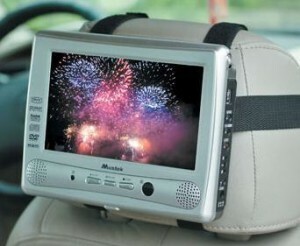 If you can, investing in a car dvd player is a lifesaver. Our Ladybug is big enough that she doesn’t sleep in the car, but does get really bored. Just like a movie, she asks over and over, “Are we there yet?” She is also smart and devious enough to know that if she claims to need to go potty (even though she just went two minutes ago and hasn’t had anything to drink) that we will stop the car at the next available clean restroom. The car DVD player helps to keep her engaged in things other than her need to pee, and when we will get where we are going. We even keep a special movie in the car that is only in the car, to help keep her interest level high. Other things we do to keep her busy, we sacrifice our iPod for the afternoon. We load it with her favorite music and let her have it. This is such a privilege for her, and its kind of cute listening to her sing along. If you travel by plane it can be more difficult. I always try to fly nonstop. Once up, once down, one boarding, one plane. It’s just easier for us. If you do have to have an overlay, I generally like to make them at least two hours. Let the kids get up and out stretch their legs and walk around the shops a little. Take your time to eat something that is special to the kids. Some airports these days even have play areas for kids to burn off some energy. Check with the airport before leaving your house to see what kinds of snacks you can bring for the kids. You can never have enough snacks. I also never go to an airport without a bag of M&Ms. Spread out one at a time, they will last and be a nice reward for good behaviors. Don’t forget special toys in your carry on! The Target Dollar Bin is a life saver for this. $5 for 5 toys. Amazing. If you have a younger one who still falls asleep in cars, try sitting by the engines. The sound could quite possibly lull your little one into a nice long nap. The most important thing to remember is to relax and to take things in stride. I can’t help your kids to not be over stimulated, or be well rested if they aren’t at home in their beds for nap time. I can’t even really help you get where you are going, but I can speak from experience that you will eventually get there.